Aladdin offers their famous kerosene mantle lamp in a hanging version, to offer you light where you want it, when you want it. Rustic and durable spun Aluminum kerosene mantle lamps. Aladdin's Aluminum lamps are great for the cabin or rustic retreat. History books and price guides available for Aladdin Kerosene Mantle Lamps, as well as Aladdin Electric Lamps, and Angle Lamps. By Author J.W. "Bill" Courter. Classic Brass Table Lamps from Aladdin. Hundreds of lamp and shade combinations to choose from. Available as kerosene or electric. Safe, bright white light with no smoke and no odor. 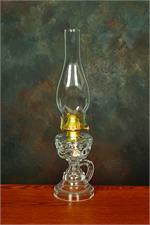 Check out our selection of inexpensive and introductory level Aladdin Kerosene Mantle Lamps. Genuine Aladdin Kerosene Mantle Lamp replacement parts for Model 7. 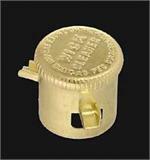 Genuine Aladdin Kerosene Mantle Lamp replacement parts for Model 8. In stock, we have Aladdin Blue Flame heater and kerosene refrigerator replacements pieces and parts. Perfect for off the grid living. Find the perfect lamp shade for your Aladdin Lamp. 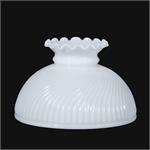 We offer a large selection of 10" Glass Lamp Shades, as well as 12" and 14" Parchment Shades. 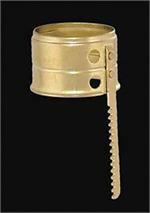 Quality, solid brass construction provides the best wick trimming. Model A or B Style Nickel Plated Electrified Burner designed to fit Aladdin Brand Lamp models A, B, C, 21, 21C, & 23 and all Glass Models. Designed for use with the R103 Lox On Chimney. This Aladdin Lamp Style Model 12 Smoke Bell fits the Aladdin Model 12 Hanging Lamp Frame, as well as most other Aladdin hanging lamp frames. Limited Production Lamp and Shade Combination! Jack's Country Store Exclusive Shade Design. 14" Parchment Shade, USA Made. Vaseline Glass by Mosser Glass. Complete lamp with Maxbrite 502 burner. A beautiful shade with satin white finish (painted) dome and crystal prismatic panels. Similar to Aladdin Lamps #N0392 and #N392 Opal White Swirl Shade, which has been discontinued. Similar to Aladdin Lamps #N0392 and #N392 Opal White Swirl Shade, which has been discontinued. Fancy crimped top! 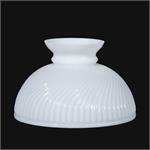 A beautiful frosted and clear 10" glass shade for Aladdin and antique oil Table Lamps. Efficiently clean any Aladdin Lamp wick! 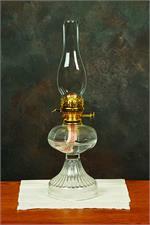 This little oil lamp has a metal reflector that bounces light downward, where it is needed most. An elegant, festive oil lamp with decorative embossed pattern. Holds enough fuel for 8 hours of burn time.